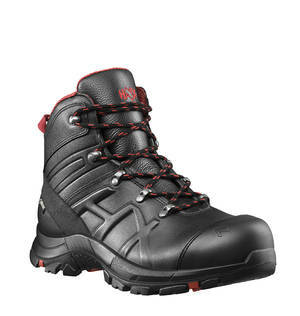 Product information "HAIX Black Eagle Safety 54 Mid"
The S3 safety shoes are electrostatically dissipative. This means that the shoes meet the requirements of the ESD standard DIN EN 61340-4-3:2002. The sole is oil and gasoline resistant. In addition, the rubber material of the sole is non marking. The safety shoes do not leave any ugly streaks on floors, even indoors. Overall, the BLACK EAGLE SAFETY 54 MID meets the highest standards for your personal safety at work.